Who are the FEU Tamaraws? When Coach Olsen Racela first met with the FEU Tamaraws as their head coach, he set out two conditions for his team. The first was simple: “Run offense. Whatever you want.” Being built under Dribble Drive principles, it wasn’t surprising they went towards that system. It was a generally easy request since they already had principles ingrained their way. The second task, however, was a totally different story. “Run your offense, without a dribble. You’re only allowed one dribble,” said Coach Olsen to his players. A common misconception about the Dribble Drive Offense is that it involves a lot dribbling. That was the idea that was within the minds of the FEU players. So when Coach Olsen gave them this second task, it felt like a chore. They couldn’t run their offense, it was a mess. But within all of this, Coach Olsen was trying to teach them one thing. “It’s learning how to move without the ball,” said Coach Olsen. But deeper than that simple idea, is learning how to trust your teammates. It’s something applicable to many things, not just how run a team’s offense. In theory, it’s a concept that should be easy to apply, but in reality, it’s difficult. Most of the FEU players, from Arvin Tolentino, to Hubert Cani and even to JR Parker were used to having the ball in their hands a lot. They were used to being stars. What Coach Olsen was teaching was new to these blue-chips. To share the basketball with limited dribbles. To trust your teammates. To have more focus on the defensive end. All of this to create an identity of who we were as a basketball team. It was a difficult concept to put into action at first. They had a bad start to the Olsen Racela era of FEU, losing to the Ben Mbala-less DLSU Green Archers during Season 80. It was an up and down regular season, as the Tamaraws could never seem to get a grasp of their identity. Some games, they’d play good defense with their offense flowing smoothly. Then there would be games they’d play to the level of their opponents. It was only fitting they ended the elimination round at 7-7. 50-50. That’s how it felt like during that time, like they were grasping for straws and just trying to survive. But it turns out, a breakthrough was closer than we initially thought. They pushed the Ateneo Blue Eagles to the brink of elimination, beating them 80-67 to force a do-or-die game. Then they pushed them to overtime in a winner-take-all contest. If there was something consistent with how they were playing in that series, it was their team work and defense. It started by working as a unit, defending basketball teams cannot be a one man job. Communication is of utmost importance. They did a great job denying the extra pass and not giving any open looks to the Blue Eagles. The offense was just a bonus, that was working to come because their team was that talented. Despite losing to Ateneo, it finally looked like FEU had figured things out. 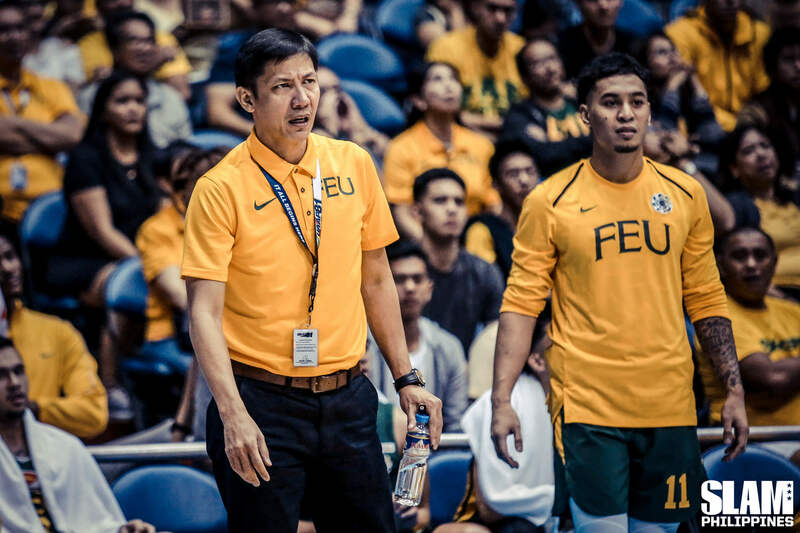 There was a consensus that this year’s FEU Tamaraws were going to be a tough match-up. It took one whole season, but it looked like what Coach Racela had been preaching from day one finally got to the team already. Share the basketball. Trust your teammates. Focus on defense. 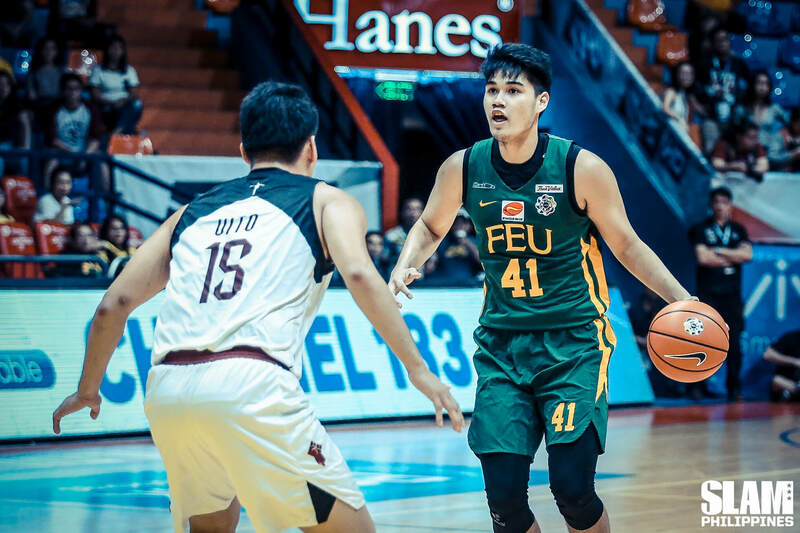 After FEU opened their season with a bang by beating the DLSU Green Archers, they shocked by the young UST Growling Tigers. Coach Racela thought it was a wake-up call to lose against a raw UST team. It turns out it wasn’t. That was a mild alarm bell compared to their next game. Against the UE Red Warriors, FEU went right back to sleep, and UE came out with a steel chair and an alarm clock, smashed it on FEU’s heads, shouting “TANGHALI NA!!!”. Losing to UE was bad enough, but to lose by 25 points? It was an indication of something wrong going on with the Tamaraws. The easiest target to point to: Coach Racela. As they say, players win games, coaches lose them. But the players knew in themselves it wasn’t a coaching problem. “Yung FEU management, pati coaches, di na sila nagkulang magremind sa amin eh,” said Comboy. They already had a year to embrace whatever Coach Racela was preaching. The Tamaraws showed they already embraced it, not just versus Ateneo last year, but also during the preseason. This was no longer a coaching problem. He wasn’t the enemy. Neither were the other teams. The biggest issue from those freak losses to UST and UE: The Tamaraws playing to the level of their competition. They did that by playing selfishly. They looked down on the Red Warriors and the Growling Tigers by focusing on themselves rather than their team. “Individually, as a player, minamaliit mo tingin mo sa team,” noted Comboy on how the mindset looked like during those losses. It was showtime. The opportunity to get one’s touches, to pour in the points. To raise one’s draft stock if you want to go even further. But basketball isn’t like that. It’s a team sport, and playing to your own accord is disrespect to the game that they love. It took two games, but the writing was on the wall for the Tamaraws. 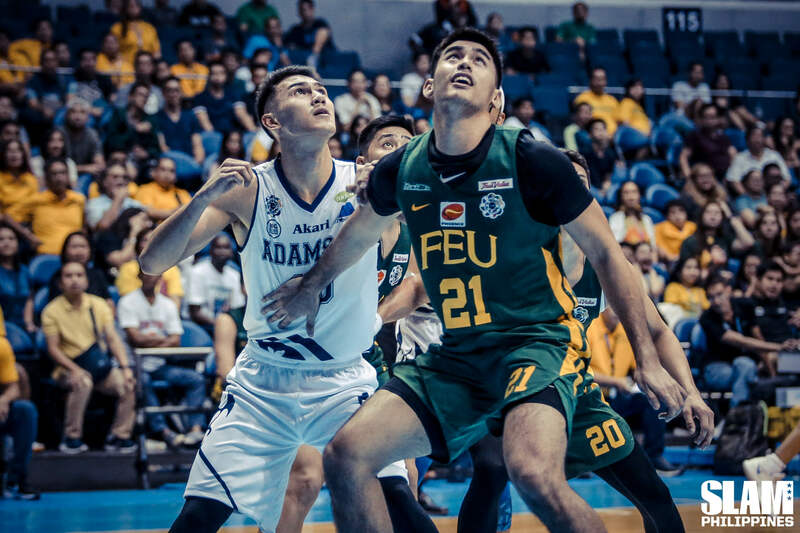 The FEU Tamaraws were back to square one with one question lingering: who are we as a basketball team? It sounds weird to have to answer that as the season went on, but the Tamaraws put themselves in that position. All wasn’t lost. They already had a foundation of how to go about things. The core players of FEU had already spent time together ever since Season 80. This was their problem to take care of. “Kaming mga player na mismo nagresolve nun,” said Comboy. Against the NU Bulldogs, the Tamaraws still looked a little shook. However, there there were attempts to try and play team basketball. It was certainly a challenge, but the Tamaraws pulled through to beat NU, 73-68. It was a start. Things weren’t going to get easier. Up next were the league leaders, the Adamson Soaring Falcons. It was a tough challenge, but FEU knew who their biggest rivals truly were: themselves. Were they going to play together as a team? Or was this showtime only for it to explode on their faces? One such player who others accused of playing showtime basketball was Arvin Tolentino. He’s Mr. Born to Score himself, but sometimes to a fault. Things have changed for him. He understands that he’s one of the barometers of FEU’s success. Since then, he’s changed how to approach the game. It showed during the early goings of their game versus the Soaring Falcons. FEU was taking less dribbles, looking to move around more for easy baskets. Tolentino in particular, continued to move within the offense, and instead of settling for jumpers, he drove to the rim for higher percentage looks. It was a fresh sight, especially with how FEU had played the past few games. Even more impressive from the Tamaraws: their commitment on the defensive end. A cool wrinkle with how FEU defended was that they putting a smaller, but quicker guard on Jerrick Ahanmisi. Parker and LJ Gonzales were pests versus Ahanmisi, putting pressure on his off-ball movement and baiting him into creating his own shot. The others did their part to, from Prince Orizu’s hustle, to Richard Escoto’s offensive rebounding, and yes, even Tolentino’s occasional moments of effort on defense. The Tamaraws hit a huge bump on the road when Tolentino was tagged for an unsportsmanlike foul. Losing their best player as the Soaring Falcons was roaring for a comeback. It was costly. Tolentino was on fire, no one in Adamson capable of stopping him. But no one player is bigger than the team. Coach Racela already laid it out. Less dribbles. Trust your teammates. Focus on defense. All the Tamaraws had to do was to follow just that. They continued to run their offense, albeit with difficulty, up until the overtime period. it wasn’t a smooth ride, but they were able to find their bearings by getting buckets at opportune moments. Most importantly, however, was how they locked in the defensive end. During overtime, they limited the Adamson to 0/9 shooting, playing picture perfect defense up until the last second. The Tamaraws had done it. Not only had they beaten the league-leading Falcons, but they had also gotten their breakthrough win for the season. Coach Racela could not help but roar. It felt like a huge monkey was taken off his back. But he didn’t do it alone. Not one man helped him in doing just that. 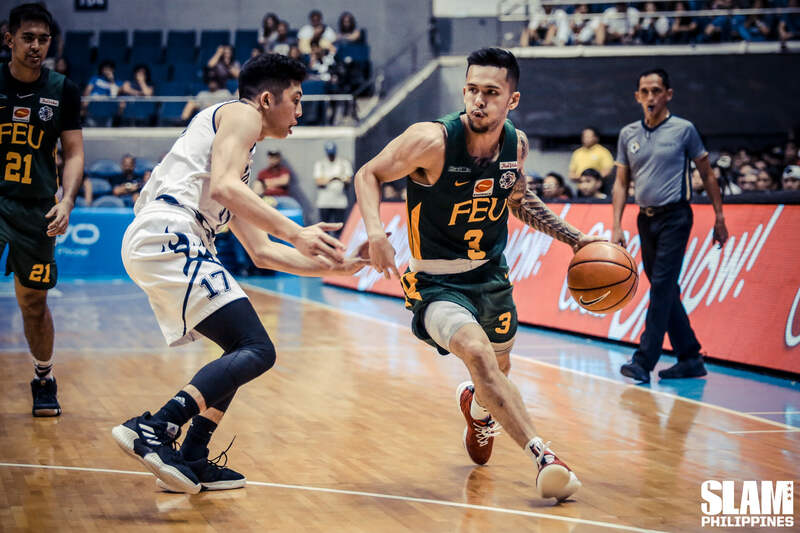 It was the entire team, the FEU Tamaraws, that helped him take it off to show the league the championship contenders everybody was expecting out of the preseason. The question still remains, however. Who are the FEU Tamaraws? One win isn’t going to answer it, as monumental as that win was. But at the very least, they have principles they can hold on to, ones Coach Racela had been preaching from the very start. This time around, it’s not the coach who has to teach it. It’s the team themselves. Less dribbles. Trust your teammates. Focus on defense.